Downloading and Installation information with graphics for ASCII database shareware. Maintain your data with simplicity and complete freedom. All kind of data, ASCII Databases, Glossaries, English/French Technical translations, ASCII User Database Manager. After downloading the files DSCANV5.EXE and Nucleus.zip on your computer, the installation takes virtually no time at all. Print or save this page for future reference. If you have any problems downloading the file, right-click on the link above and then select 'Save target as' (in Internet Explorer) or 'Save link as' (in Netscape Navigator/Communicator). It sometimes helps to press the "Refresh" button in your Web browser and to clear the Web browser cache before downloading. Wait until the end of the unzipping process. It should only take a few seconds. Read it, if you accept it you can continue. You will be asked to select the components you want to install. The Program Files are required. The English French Nucleus Database is optional. You can also select a different path if desired. By default the English French Nucleus Database is selected. You can later on add the English French Nucleus Database by restarting the Installation. During the installation (a few seconds) the progress bar will show you the development of the process. 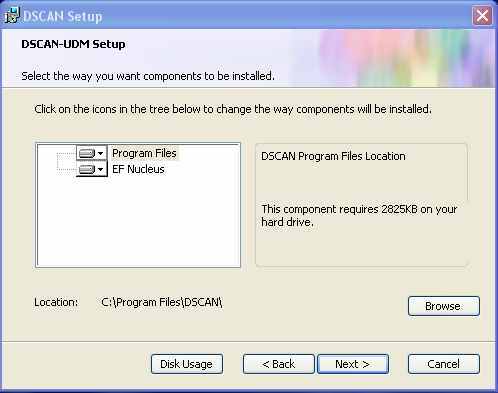 The installation will create the Start > Programs > DSCAN-UDM main menu options. 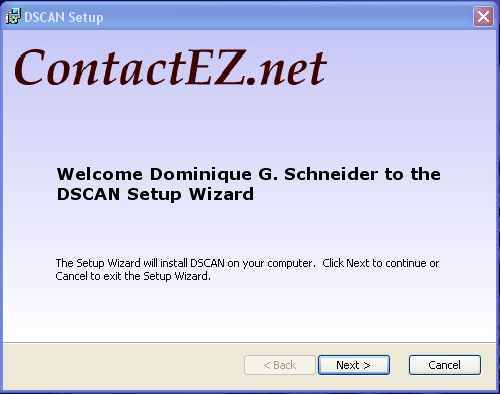 You ar enow ready to use DSCAN! The DSCAN-UDM installation is done. If desired, you can later update the Nucleus database anytime you want. 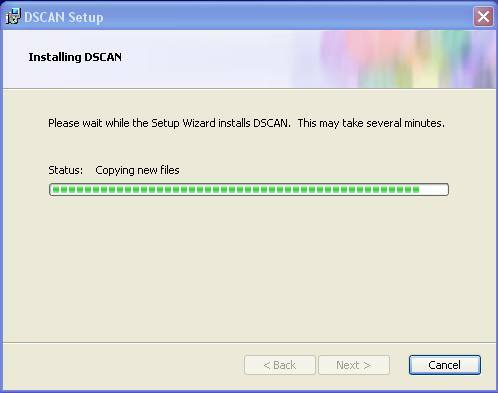 The DSCAN MSI can repair, replace, and verify files. A partial or complete application reinstallation might be required if any files or registry entries associated with any DSCAN feature have become corrupted or are missing. 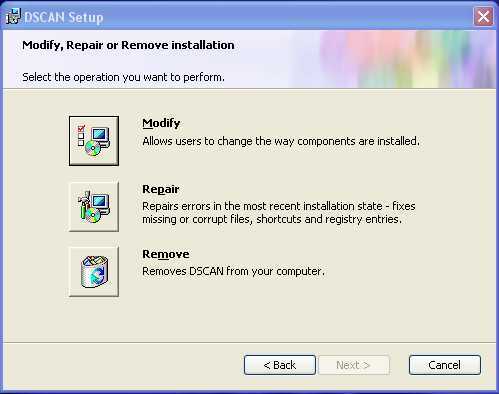 To modify, repair or remove DSCAN from you computer go to Start > Control Panel > Add or Remove Program. Then Select DSCAN from the list. 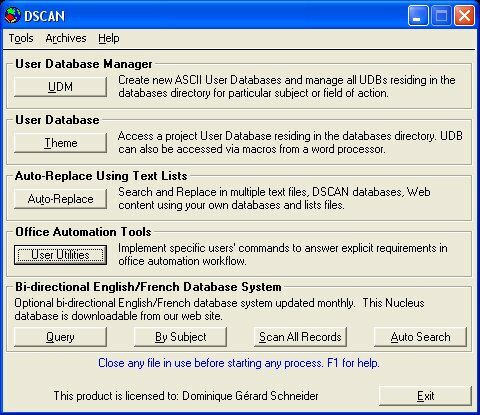 When payment is received we will send you the latest Nucleus Database System and a license file for DSCAN-User Database Manager. 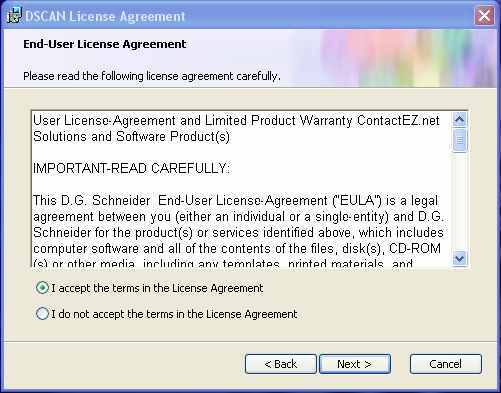 The license file may not be provided or otherwise made available without proper authorization. For more information on the registration's process, read the readme file located in the DSCAN home directory after its installation or contact dgs@contactez.net.